Water could be drawn, brought in and put in a basin or kettle, warmed (?? ), and then wishy-washy, wishy-washy and all the clothes were magically cleaned. Ummm, NO! My knuckles hurt just looking at this picture! By this time, lye soap was being made with animal fats and ashes from the fires. It still looks like quite a bunch of work though. In 1874, William Blackstone of Indiana built a birthday present for his wife. It was a machine which removed and washed away dirt from clothes. 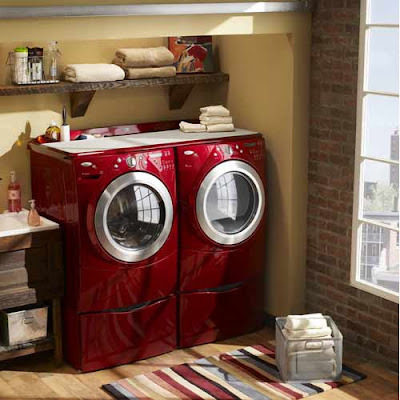 The first washing machines designed for convenient use in the home. Ok, bless him and curse him! A Birthday present??? Well, if it was the machine or the "hand machine" above.... yup, a washer says love to me. 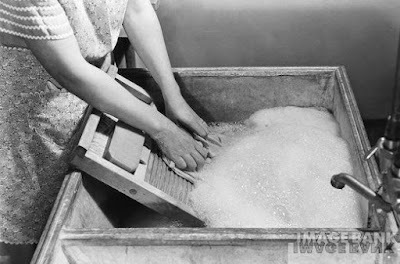 The Thor was the first electric-powered washing machine. Introduced in 1908 by the Hurley Machine Company of Chicago, Illinois, the Thor washing machine was invented Alva J. Fisher. 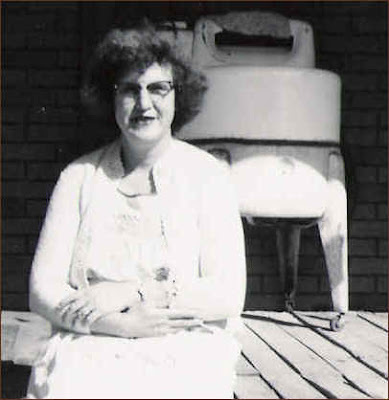 The Thor was a drum type washing machine with a galvanized tub and an electric motor. A patent was issued on August 9th 1910. Electric motor... now we're getting there. Did you notice the green? Wonder if they made them to match your house, porch or wherever they were located? And what if you didn't have electricity? Maybe you had one of those tractor motors or drive belts to help you out. Sheesh! Once the washer was electrified, it must have felt like a HUGE load off a woman's weekly shoulders. I don't know about you, but I started my married life running to the corner laundromat that was usually further than a corner away. Taking a few days worth of clothes, a bunch of quarters, something to read, I would settle in for a L O N G afternoon of waiting while my clothes washed and wondering all the time what was washed last in that machine and were my clothes going to be sanitary when I got them out. And remember that even with the dryer cranked to high heat, it still took at least $2 to dry a load. After having my second child (and cloth diapers!) we decided we better find a washer/dryer combo of our own. It was TOO difficult for us to take 2 small kids, a weeks worth of clothes for 4 and a diaper pail full of dirty diapers to the laundromat. I was one of the luckiest women on earth!! No more trips out, I could put laundry in at any time and take it out at any time. Now all I had to do was sort, stuff and add a bit of soap. It was definitely a turning point in my washing career! I've had something like this most of my married life. 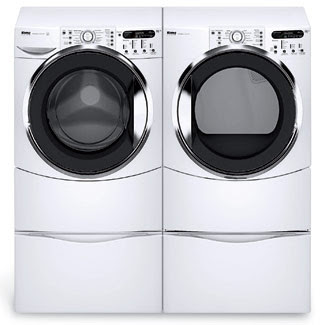 When we had a houseful of teenagers, we opted for the heavy duty models of washers, ones that could hold LOTS of laundry freeing up even more of my time. When the washer or dryer would go on the fritz and I'd have to drive to the laundromat for a time, it was always first priority to get them fixed or replaced. or this.... look at all the extra room and compartments to store the clutter in! Or this...RED, can you believe it? 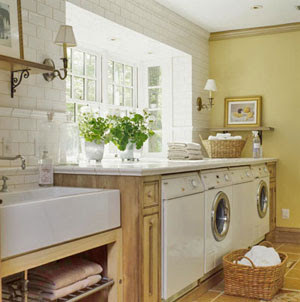 This is one of the warmest most inviting laundry rooms around! A laundry room with a VIEW! 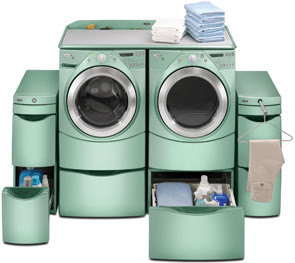 I'd only have to totally redo my laundry room so my brand new machines would look good in it. A room totally devoted to washing clothes..... I think I'll pass. Thanks to About.com/Inventors for providing the History of the washing machine.